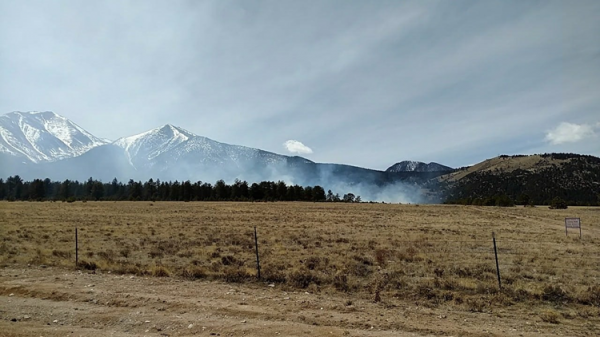 This year already Wild Fires have happened in Buena Vista and in Colorado Springs. thinking for You and Your Family. A wildfire can spread quickly across forests and fields, giving you little time to evacuate to safety. Drought, dry conditions, and the careless use of fire all contribute to increased risk of wildfire. Get the facts about wildfires and learn what to do to keep your loved ones safe! 1. Listen to local area radio, NOAA radio or TV stations for the latest wildfire information. 2. Be prepared to evacuate at a moment’s notice – use the map below to track current fires and find open shelters. 3. Check your emergency kit and replenish any items missing or in short supply, especially medications or medical supplies. know your routes to get there. Back your car into the garage or park it outside in the direction of your evacuation route. - Keep indoor air clean by closing windows and doors to prevent outside smoke from getting in. - Do not use anything that burns and adds to indoor pollution such as candles, fire places and gas stoves. Dress to protect yourself: wear cotton/woolen clothing including long sleeve shirts, long pants and gloves. Shut off gas meter only if advised to do so by local officials. If you have a propane tank system, turn off the valves and leave them closed until the propane supplier inspects your system. Open fireplace dampers and close fireplace screens. Burning embers will not be “sucked down” into a home from the outside. Wet down your roof (if combustible). Close windows, vents, doors, blinds, or noncombustible window coverings, and heavy drapes. Remove lightweight drapes and curtains. Move combustible furniture into the center of your home away from windows and sliding-glass doors. Close all doors and windows inside your home to prevent draft. Place sprinklers up to 50 feet away from the structures to raise the moisture level of nearby vegetation. Remove combustible items from around the home, lawn and poolside, such as furniture, umbrellas, tarp coverings and firewood. Gather fire tools (shovels, hoes and hoses) and make sure they’re easy to access. Be aware that water pressure will probably decrease due to heavy demand for firefighting. Water may not be available at all because electric pumps have failed or water reservoirs are drained. If you are trapped, crouch in a pond, river or pool. Do not put wet clothing or bandanas over your mouth or nose. Moist air causes more damage to airways than dry air at the same temperature. - Look for shelter in a cleared area or among a bed of rocks. - Lie flat, face down, and cover your body with soil. - Breathe the air close to the ground to avoid scorching your lungs or inhaling smoke. Install or develop an adequate outside water source such as a small pond, cistern, well, swimming pool or hydrant.